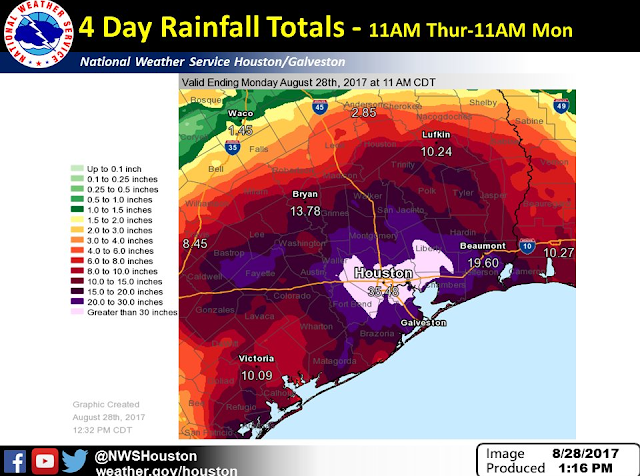 Houston Is Drowning One Neighborhood At A Time. Courtesy Of Houston Oil & Gas On Twitter. 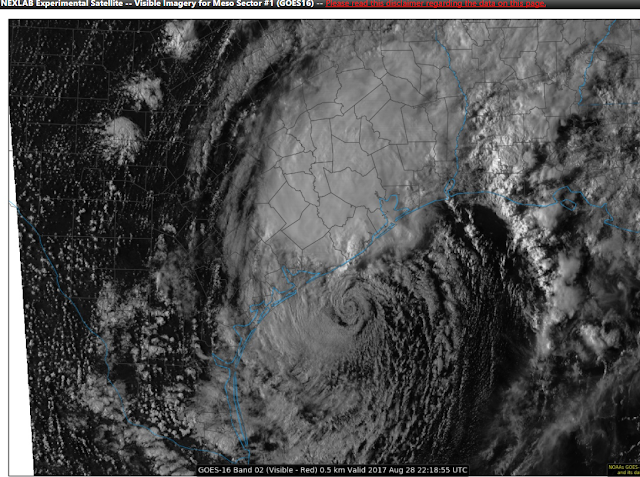 Visible Satellite Image Of Tropical Storm Harvey. Valid At 4:18 PM MDT This Monday Afternoon. Note that swirl in the middle of the image. That's not what you want to see which means that Harvey has developed a closed circulation again. The latest National Hurricane Center (NHC) Advisory at 3 PM MDT Harvey is very slowly strengthening. 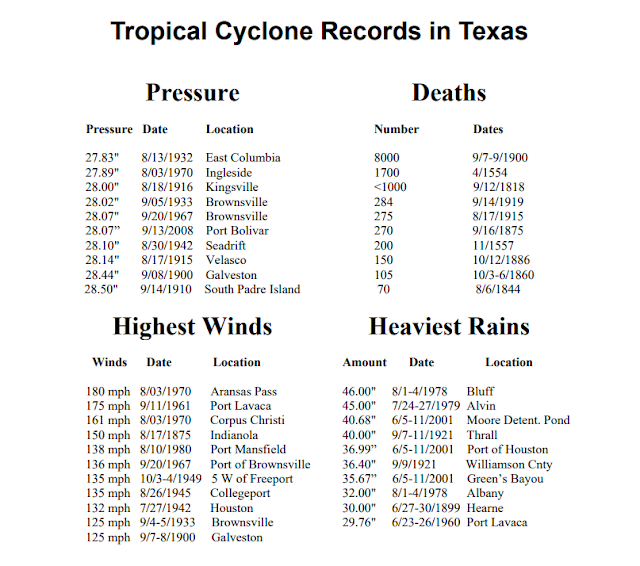 He now has sustained winds of 45 mph with a central pressure of 994 millibars or 29.44 inches of mercury. Harvey was located just south of Matagorda moving slowly to the east-southeast at 3 mph. Tropical Storm Harvey Forecast To Slowly Strengthen & Move NE. 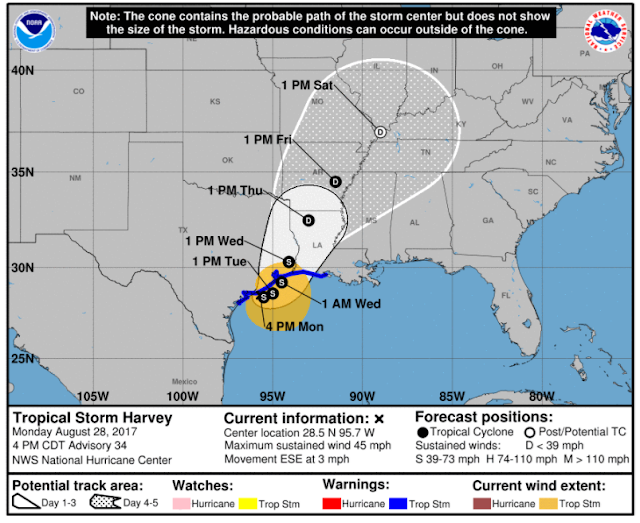 Harvey is currently forecast to gain some strength but not obtain Hurricane status before looping back to the northeast and making landfall near the Galveston area by Wednesday. Lets hope the computer model forecasts are right and this is how he plays his cards between now and then. The worst thing that could happen is that he stalls again over the warmer waters of the Gulf to the east of his present location and strengthens back into a Hurricane. 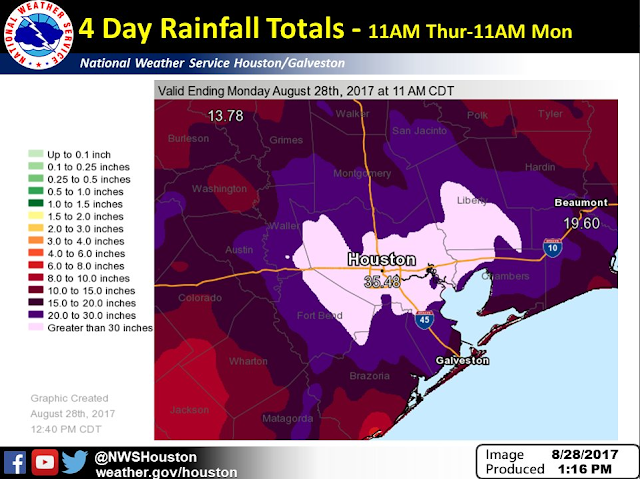 4-Day Total Rainfall From Harvey. 24-Hour & 72-Hour Rainfall Totals. Harvey's rainfall has simply been incredible! As of 3:39 PM CDT this afternoon the heaviest rainfall total I could find in the past 24-hours rainfall was the 18.35" 1.0 miles north-northeast of Katy in Harris County. 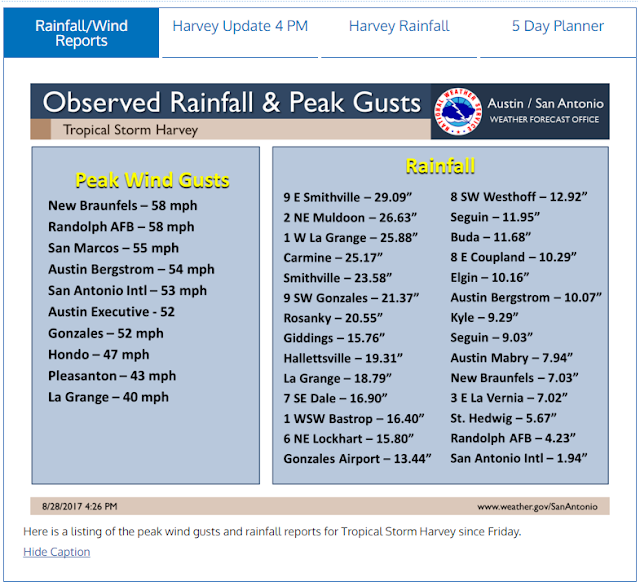 The highest storm total so far that I could come up with (past 72 hours) as of 3:29 PM CDT this afternoon was the 36.34" measured 4 miles west-southwest of First Colony in Fort Bend County. Storm totals as estimated by radar in the Houston area indicate that nearly 40" has already fallen and that was as of this morning. 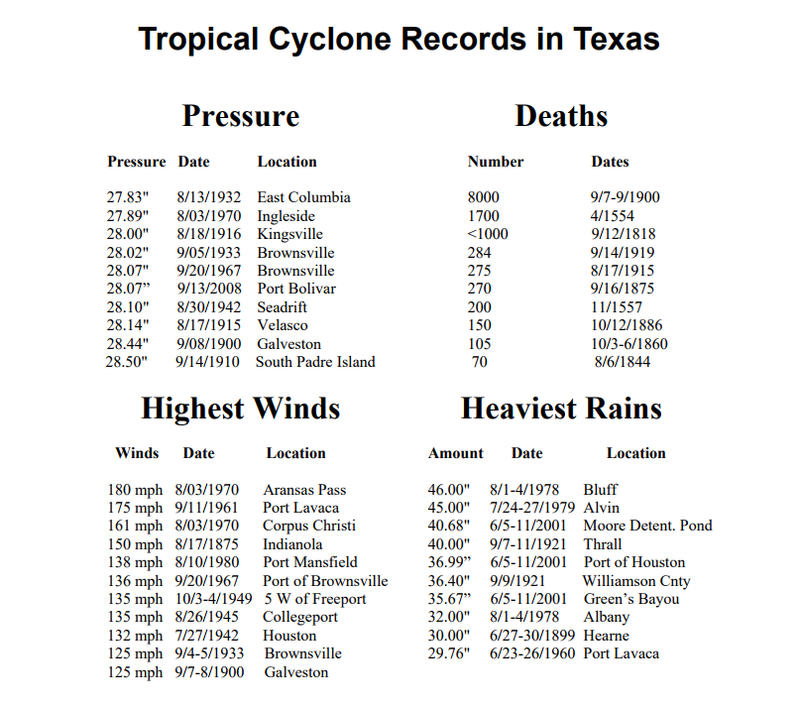 The Houston Intercontinental Airport set a new 24-hour rainfall record yesterday with 16.07" which beat the previous record of 8.32" set in 1945. The greatest 72-Hour total I could come up with via the CoCoRaHAS web site in Harris County was CoCoRaHAS Station (TX-HRR-223) 5.6 miles north-northwest of Mission Bend. 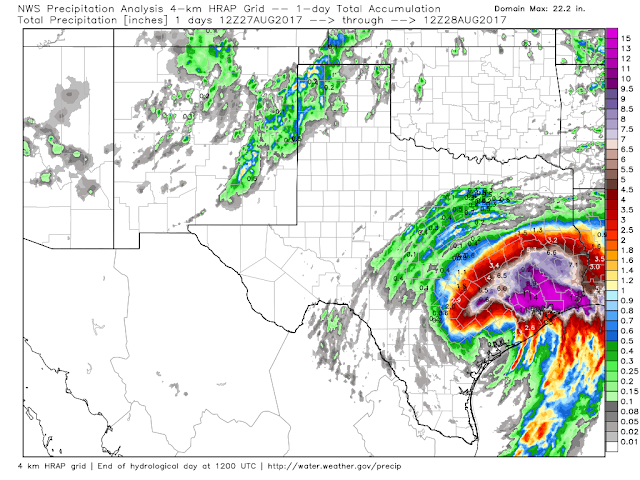 NWS NDFD 24-Hour Rainfall Totals. NWS San Antonio/Austin Rainfall Totals. 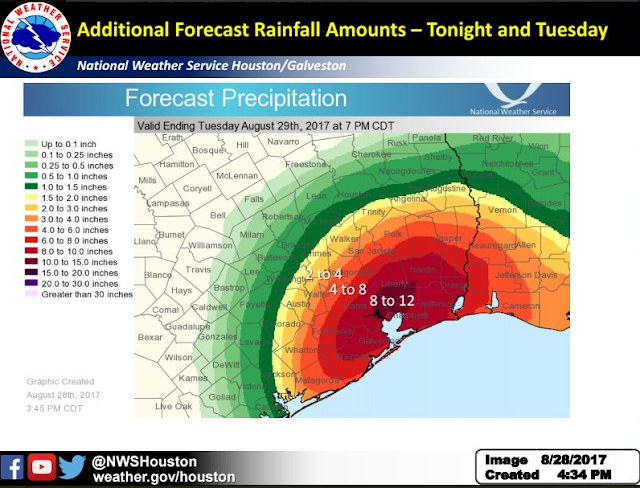 NWS Houston Forecast Rainfall Totals. Sadly another additional 4 to 12 inches of rain is forecast to fall tonight into Tuesday on top of what has already fallen over the past four days. 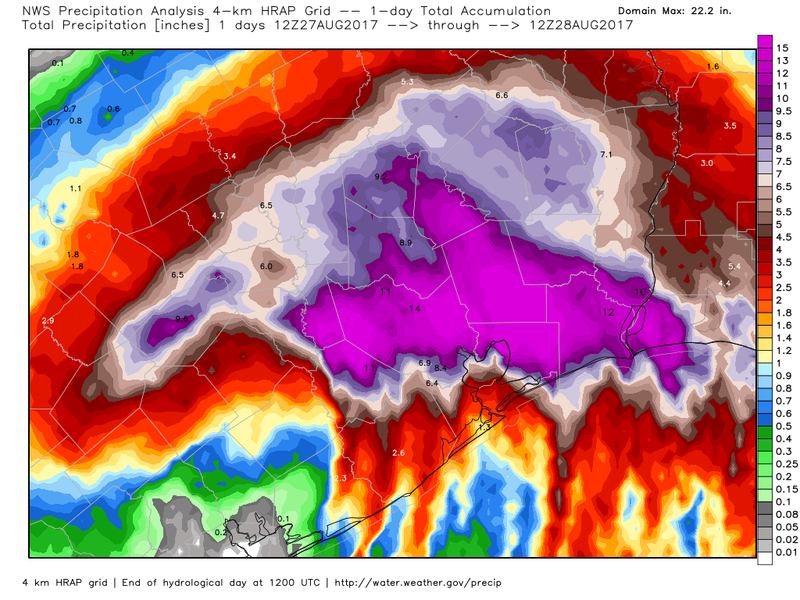 Houston is simply slowly drowning one section of the city at a time. Rivers, streams, creeks, bayous, and lakes in the area simply cannot hold any more runoff from the torrential rainfall. Many are already way out of their banks. 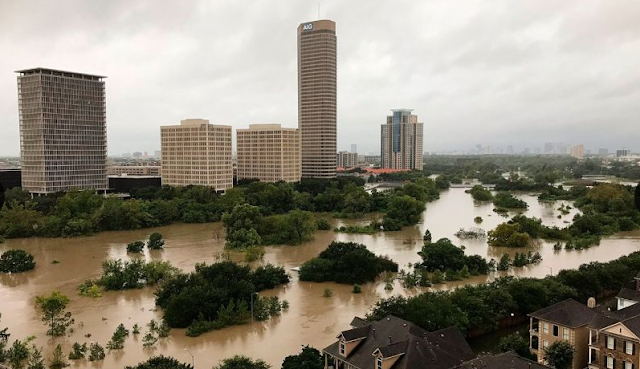 Local officials begin releasing flood waters from some of the lakes in the area today hoping to spare the downtown area of Houston but all the while flooding additional neighborhoods in the process. There just isn't anywhere for the water to go as it continues to come down in buckets from the sky, deepen, and spreads across the city and surrounding countryside. Harris County Flood Warning System. This map shows the rivers, creeks, and bayous that are flooded as of 4 PM MDT this afternoon. The map is interactive so click on the link above to get the latest updated information. The red dots indicate flood waters that are out of rivers, creeks, and bayou banks. NWS Advanced Hydrolic Prediction Service (AHP). 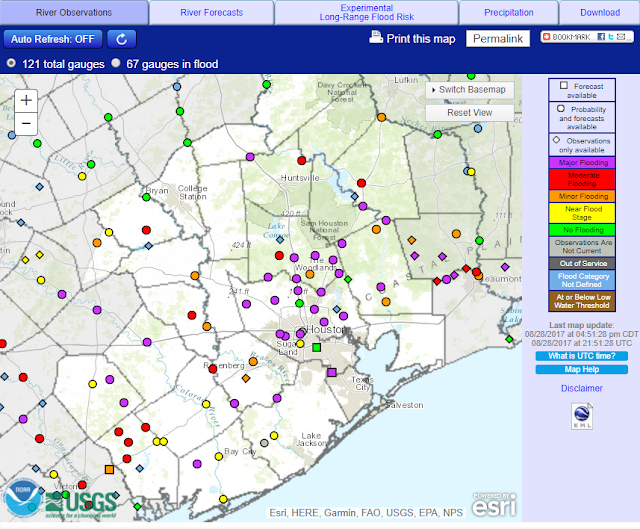 As of 4 PM MDT 67 of Houston's 121 river flood gauges were in flood stage. East Fork San Jacinto River Near Caney. 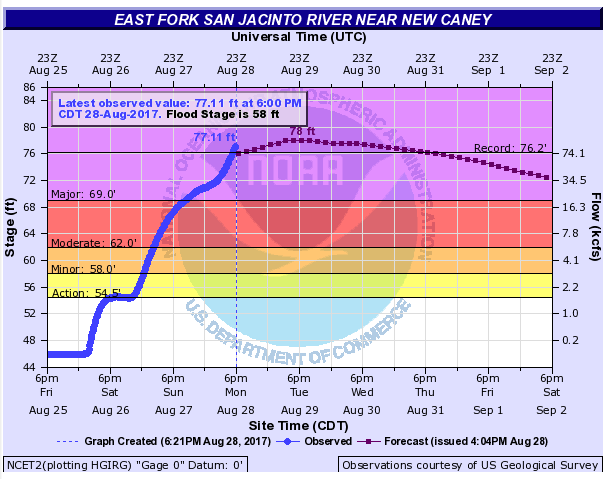 A case in point is the East Fork of the San Jacinto River near Carney northeast of Houston. The flood gauge was showing a level in the river of 77.11 feet! Flood stage is 58 feet. 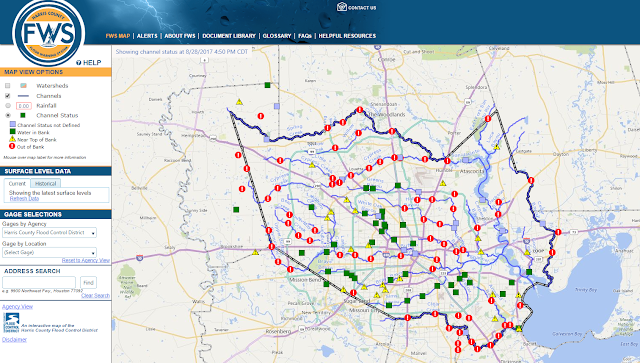 All 22 watersheds in the Houston area are flooded. Roads Flooded In The Houston Area. Local News Reported That Over 250 Roads Were Closed In The Houston Area This Morning. 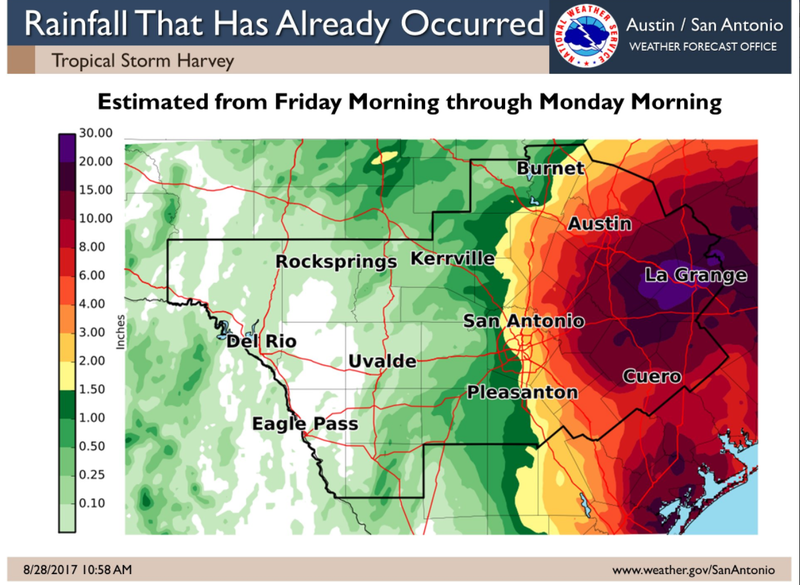 A lot of quotes in the news media the last couple of days about Harvey already or will be the worst weather disaster in Texas history. Uh I don't think so. 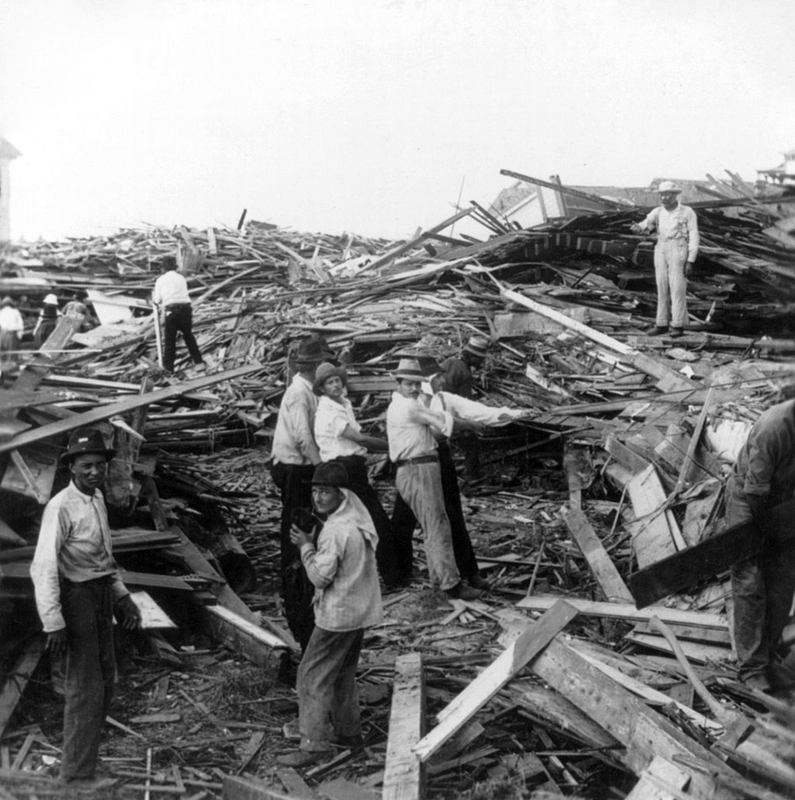 As tragic as Harvey is and potentially will be when its all over with you still can't top the September 8th,1900 Hurricane that drowned 8,000 to 12,000 people in Galveston. Family Of 6 Drowns & Missing. Cajun Navy Comes To The Rescue. 75,000+ Calls For Rescue This Morning. 30,000+ Already In Shelters - More On The Way. Alligators Swimming In Woman's Back Yard. National Guard Utilizing 16 Helicopters For Rescues. All 12,00 Members Of Texas National Guard Mobilized. 8,500 FEMA/Federal Employees Helping Local/State Officials. 2500+ Rescued By Local Officials - Hundreds If Not Thousands More By Local Volunteers.